How to size and choose a solar inverter? 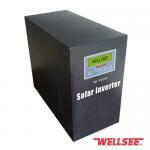 Your Position: > Knowledge >> solar inverter >>> How to size and choose a solar inverter? When the solar panels absorb the lights and transfer the energy to the PV cell, there is a DC current, then the energy created and stored in a battery bank, then you need a solar inverter to run your appliances. For regular consumer use, and alternating current (AC) is needed – 220volt or 110 volt AC powered home appliances require AC electricity. This is where an inverter comes in. 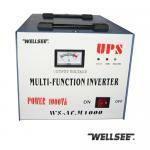 The inverter takes the direct current and, in simplified terms, runs it through a transformer. It is almost as though the inverter is tricking the transformer into thinking it is getting AC by forcing the DC to act in a way similar to AC – the inverter runs the DC through two or more transistors that are rapidly turned on and off and feeding two different sides of the transformer. The alternating current used by a city electric grid is a pure sine wave. It runs smoothly up and down in an arced, wave-like motion. Of course, an inverter that produces a pure sine wave often costs more than other inverters – only higher quality solar inverters produce pure sine waves. Another kind is modified sine wave, on the other hand, rises up to the positive point and down to the negative point in steps – it looks like a stepped square wave. While many appliances will run on this type of sine wave, they may not run as well (e.g. while computers and TV’s will run, certain bread makers, microwaves, washer and dryers, etc. may have problems with the modified sine wave.) Also, items with motors will end up using more power when using a modified sine wave versus a pure sine wave. 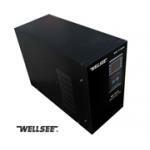 Then how to choose a suitable solar inverter? No matter that the first use his car battery current specifications, and buy a power output of 800 watts of solar inverter. Then, the first battery in this moment the extent permitted use, so in the future for a greater use of the car and then full power. 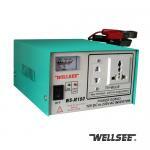 100 watts is enough, then you can buy a low-power solar inverters. In addition, in determining when the solar power inverter, there is an important principle, namely, the use of solar power inverter, do not run full term, otherwise it will shorten the life of solar inverter, solar inverter failure while Rate will significantly rise. We strongly recommend that users, preferably not more than 85% of rated power using solar energy inverter state. Finally, how to test solar inverter? Low-voltage protection: in the solar system can work for some time, the battery’s power gradually reduced to 10.5V when the solar inverter alarm, sensitive electrical appliances (such as computers), please stop using it. Ignore the alarm voltage down to 9.7V-10.3V solar inverters automatically shut down,Overvoltage Protection: Charging system failure, battery voltage rises to 15.5V or more solar inverter stop working.Short circuit protection: solar inverter work, 220V output short circuit, the red light flashing, and remove.Over temperature protection: in the solar inverter full load after a period of continuous work, the shell body temperature reaches 55-65 degrees and cut off the power when the alarm. Thus, If using solar inverter rated power than a refrigerator, air conditioning to start the solar inverter, can be automatically protected if protection is a real good product. i know how to select the inverter now, thanks very much.Do you have 110V 60Hz inverter that can be used in the USA here? yes,we have 110V 60Hz inverter that can be used in USA, no problem.